This In Focus explores Women Singing II – a painting inspired by pop singers that Willem de Kooning saw on television – as the product of a shifting, mutable act of remembering and an iterative creative process involving drawn, traced and recycled imagery. 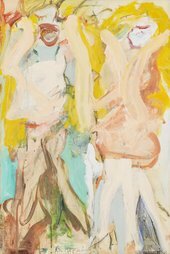 Painted in creamy, pastel tones in 1966, Women Singing II is one of many images of female figures that Willem de Kooning created throughout the 1960s after moving to a more rural area of Long Island, and carries the pop cultural references that suffused his earlier women paintings of the 1950s. This In Focus project situates Women Singing II within de Kooning’s process of melding figure and ground and his continued engagement with the female form, examining the work’s close connection to other paintings made around the same time. It considers de Kooning’s relationship with the political climate of the 1960s in which he was working, as well as the role of the body in 1960s aesthetic discourse and abstract expressionism more broadly. Published in September 2017, the project is authored by Valerie Hellstein (independent art historian) and includes a contribution from Richard Shiff (University of Texas at Austin).